It has been a busy old week at Toasted Glass HQ and although we are barely into Autumn, the Christmas orders are already beginning to roll in. As sole designer and painter, this means that my time is largely spent, paintbrush in hand, hunched over, wishing my studio wasn't the coldest room in the house. However, help is on it's way, in the form of a free standing gas heater, so I will have no cause for complaint and of course, at the end of a long day of painting, there's always the promise of a cocktail to refresh and invigorate. 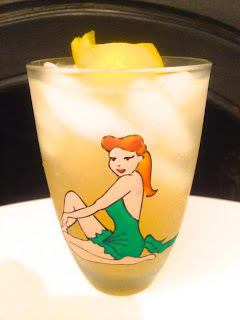 Strangely, despite the cold, I am no less inclined to charge my shaker with ice and create a new libation and seeing as I have been painting rather a lot of Vintage Pin Up Girl designs lately, I thought I would create some drinks for them. Of all the drinks I made this week, the Bramley Blue was Mr TG's clear favourite. If I want to curry his favour, I can guarantee a positive response to any drink I create, that contains lime, mint and sugar and I have noticed he is also rather partial to a dash of triple sec. However, having used the last of the triple sec in last week's creations, I turned to it's rather garish counterpart, blue curaçao. Blue curaçao can vary, depending on the brand you buy, but essentially, it is made with citrus peel (from the laraha fruit), as is Curaçao triple sec, although some, such as Bols Blue Curaçao, also have added spices. 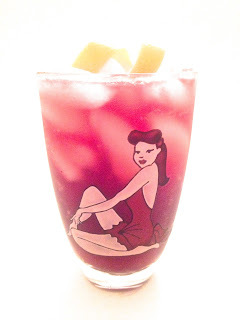 The overriding flavour of both liqueurs, however, is that of orange and of course, it is sweet, so despite the comedy colour, it actually mixes well with many drinks, but if you find it a little off-putting, just use triple sec instead. The star of this drink is the Chase Bramley Apple Vodka, a purchase made whilst taking a guided tour of the distillery earlier this year. It has a slight sweetness, tempered with the sharpness of Bramleys and a very natural, apple flavour. In short, it is delicious and can be enjoyed, ice cold and straight up as well as being a fine addition to the cocktail cabinet. Before cutting the lime for squeezing, pare off a thick strip, using a small, share knife, ensuring the pith is left behind. Add everything else apart from the sparkling water and garnish to the shaker with a handful of ice. Shake hard for around 20 secs and then strain the contents into an ice filled tumbler. Top up with a dash of sparkling water and garnish with a strip of lime zest, twisting it over the drink to release the citrus aroma. This next drink contains my two, latest purchases from my favourite purveyors of fine spirits and liqueurs, Amathus Drinks; Van Wees Three Corners Gin, distilled in Holland using only juniper and citrus as it's botanicals; and Cartron Creme de Peche de Vigne, a superior peach liqueur that uses a maceration of real fruit, rather than any artificial flavourings. The result is a slightly floral and fresh flavour with plenty of citrus to counteract the sweetness of the peach. Add all of the ingredients apart from the water and the garnish, to a shaker with ice. Shake hard until the outside of the shaker begins to frost and strain in to a chilled, ice filled tumbler. Add a dash of sparkling water to top up the drink. Garnish with a strip of zest, twisting it to release the essential oils. This final drink combines the bitter orange of Campari with the sweetness of ruby port to create a complex mix of flavours that give this cocktail real depth.and of them all, this was possibly my favourite drink of the week - I can't seem to get enough of port in cocktails at the moment. 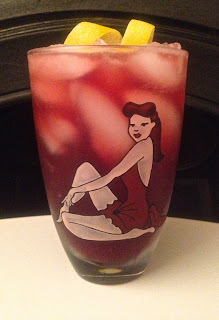 Plus, I just love that unexpected, slightly bitter aftertaste from the Campari - delicious! Add all of the ingredients, except for the sparkling water and garnish, to a shaker with ice. Stir with a bar spoon (long handled, like a sundae spoon) until the outside of the shaker develops a frosty bloom. Strain the contents into an ice filled tumbler and top with a dash of sparkling water and a twist of lemon zest.